Talalay or Dunlop Latex Mattress? If you're confused about the difference between Dunlop and Talalay, here's how they differ. They are neither types of latex nor types of rubber trees, but types of processing. Dunlop is the traditional manufacturing process that’s been in use since 1929. The latex serum is whipped in a centrifuge, poured into a mold, covered and baked. The natural sediments in the mixture settle to the bottom of the mold. This makes Dunlop layers slightly firmer on the bottom side. The Talalay process is more high tech. 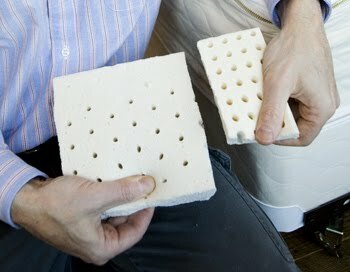 To make natural Talalay, after the latex is poured, the mold is sealed and the process continues in a vacuum. Then the mold is flash-frozen to stabilize the material. Because of the added steps, Talalay latex has a more consistent cell structure top to bottom and edge to edge, and it is more expensive than Dunlop. 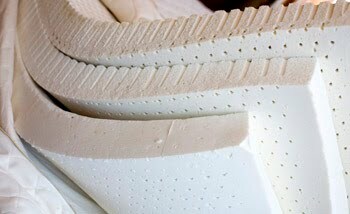 All Talalay pieces wider than 40" are seamed with Simalfa--a safe, water-based glue. We can say with confidence that neither is superior to the other. What matters more is how the latex is handled out of the mold, how it is packaged, shipped, and ultimately, what is in the end product. What matters most of all is which type will feel better to you. What other variables are there? Some companies add “fillers” such as clay to make the latex go further. (If you find a Queen natural latex mattress for $1000 or less, there are fillers.) And some companies boast “perimeter support”, known in the industry as racetracking. That means they use cheaper materials, usually polyurethane foam, around the outside of the latex. This does make the edge of the bed stiffer for sitting on. It also reduces the sleeping surface by up to 20%. While it's true that Talalay has a wider range of ILDs, or firmness grades, in our experience Dunlop is heavier and more durable. If you like a very soft mattress, you will want Talalay at least for the top layer. (A layer of Soft Talalay is softer than a layer of Soft Dunlop.) If you have children who mistake their mattress for a trampoline, you will want Dunlop. That is why we sell both. We are also happy to combine the two. Feel free to call us at 612-374-4581, and we'll guide you to the right combination.